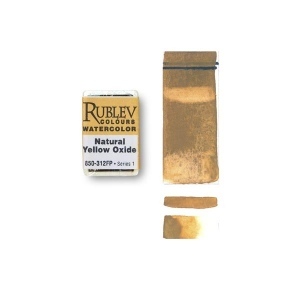 Rublev Colours Natural Yellow Oxide is an opaque golden yellow with good tinting strength, fine grained and brushes "long" in the direction of the brush stroke. Our yellow oxide is a single pigment color made of natural hydrated iron oxide mineral from the last remaining European company operating the ochre deposits in the French quarries of Gargas and Rustrel nestled in a 12 mile long enclave in the heart of the Luberon Massif, the ochre country. Hydrated iron oxide is the principle coloring agent in yellow oxides. This color is based on the natural mineral goethite associated with varying proportions of others mineral such as clay, chalk and silica. They differ from other ochres in that they contain water. In other words, the iron to which they owe their color is hydrated iron oxide. 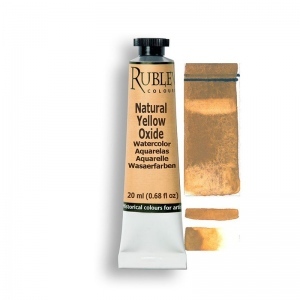 Natural yellow oxides are opaque, absolutely permanent and have good covering power. 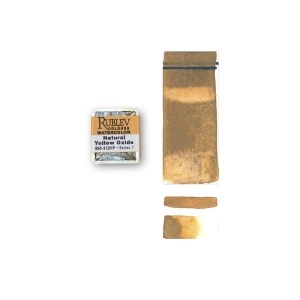 They are typically more opaque than yellow ochres, because they contain a greater amount of iron oxide. Formerly, there was much confusion in the nomenclature of the hydrated iron oxides; the names provided in the Color Names table are those specified in the ASTM Standard. Common Names: Mars yellow is the name given to the artificial substitute of natural red iron oxide.